Soak up the sun… and savings! The new money-saving coupons for April will put a spring in your step and keep money in your wallet. We make stretching your dollars on the foods you want the most, easy. See the coupons. 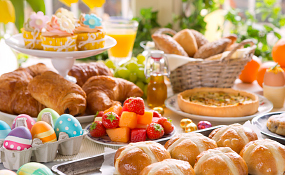 Swing into spring by hosting a simple yet scrumptious Easter brunch, complete with sweet, savory, and holiday-favorite foods. Get great entertaining tips and crowd-pleasing recipes like Pork Loin Roast, Shrimp Scampi, Speckled Malted Coconut Cake, and more. Hop on over now. It’s time to refresh your pasta dishes with the sights and scents of spring produce. 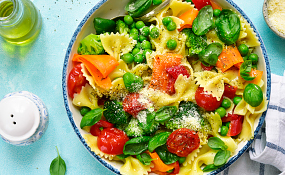 Pasta Primavera, Springtime Pasta Salad, and Healthy Fettuccine Alfredo with Cauliflower Sauce and Peas are just some recipes perfect for celebrating the season’s incredible flavors. See the recipes now. Copyright © 2019 Media Solutions Corp. All Rights Reserved.